For the ENDAIDS2030 Festival we are holding the World AIDS Day Jamm on Saturday, December 1st. A line-up of some of London’s most eclectic upcoming talent will play at Brixton Jamm to mark the 30th anniversary of World AIDS Day. 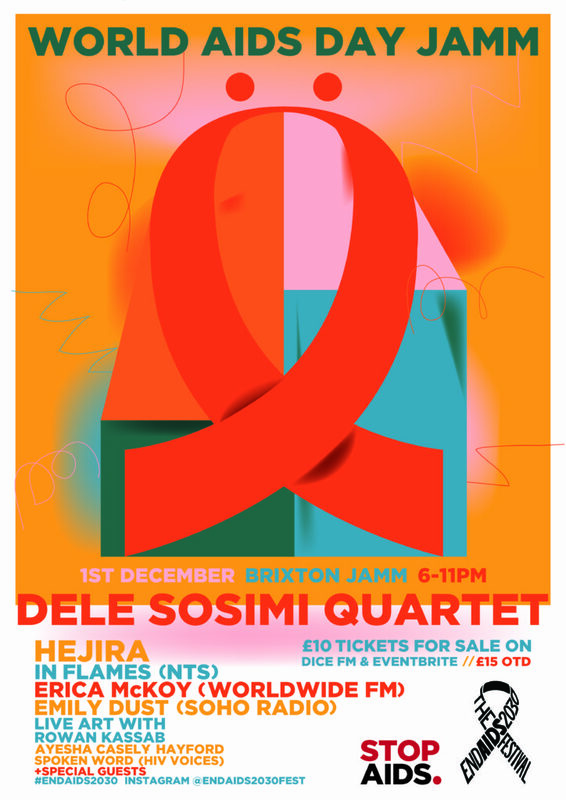 Organised by STOPAIDS, World AIDS Day Jamm will see performances from an array of exciting DJ’s, bands, and world music legends, including Dele Sosimi, one of the world’s most active and electric musicians on the Afrobeat scene. The event will mark the finale of ENDAIDS2030, a week long festival bringing together the domestic and international HIV and AIDS sectors. The festival aims to raise awareness among the public about HIV, and increase political commitment and funding. All proceeds raised from ticket sales and donations will go to further building awareness and engagement in the global HIV response. World AIDS Day Jamm is on Saturday 1 December between 6-11pm at Brixton Jamm. Tickets are £10 and are available from DICE Tickets and Eventbrite from 12th November. Tickets will also be available on the door for £15.